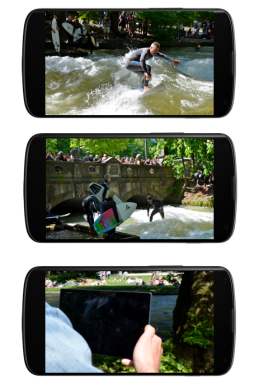 HIGGS bundles video-streams from different smartphone devices to create one multi-perspective livestream for your event, which you can then broadcasted to Facebook and/or YouTube. With the director app you can select from the different perspectives which one you want to show at any given time and then transmit the livestream to your social media accounts. Camera cuts are edited in realtime, so that no post production is needed. All smartphone users with the HIGGS-app become your cameramen.